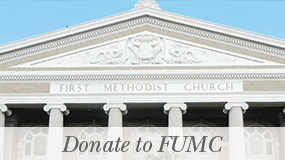 First United Methodist Church is located at 1201 Lavaca Street Austin, TX 78701 on the northeast corner of Lavaca Street & 12th Street, on the west side of the Capitol in downtown Austin. 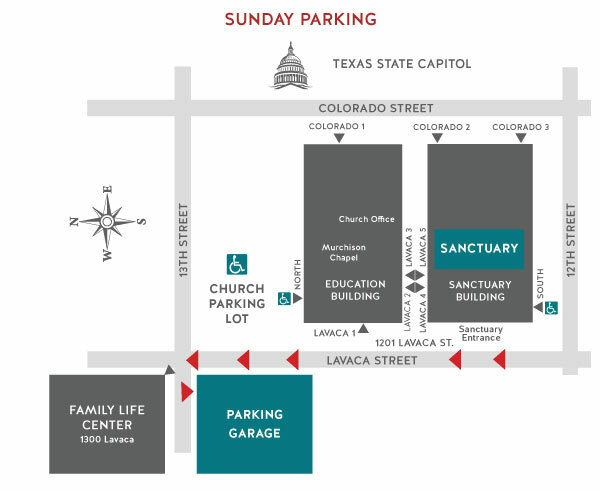 The FUMC Family Life Center is located across the street diagonally from the church at 1300 Lavaca Street Austin, TX 78701, on the northwest corner of Lavaca Street and 13th Street. 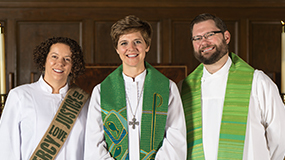 The church parking lot is reserved for FUMC newcomers, guests, and those needing access to the accessible elevator and entrance on the north side of the Education Building (North Entrance). All able-bodied members are asked to use the free parking available on Sundays. Trial Lawyers’ Garage (southwest corner of 13th and Lavaca) is available on Sundays from 7 a.m. to 10 p.m. (Enter on 13th). Roof top of the TSTA garage on 12th Street and Lavaca is open on Sunday mornings. Parking for church business is available at all times in spaces marked “Church Business” in the church parking lot at 13th and Lavaca. Preschool spots may be used after 2:00 p.m. Please do not park in spaces reserved for Texas Trial Lawyers Association at any time. Monday through Saturday, on street parking is metered from 7 a.m. to 6 p.m. – 25 cents for each 15 minutes – 3 hour maximum. Handicap entrance is located at 12th and Lavaca (southwest corner entrance) marked South Entrance. Elevator access is available just inside the South Entrance at the southwest corner of the building with handicap accessible bathrooms on the first and third floors. Portable hearing devices are available for services. Please ask an usher for assistance. Handicap entrance located off the parking lot on the north side of the building, marked North Entrance. Elevator access at northwest corner of the building just inside the North Entrance. Handicap accessible bathrooms are on the first and second floors. Elevator access is at southwest corner of the building. If you have an accessibility request, please make it in advance to Mark Steves at mark@fumcaustin.org or 512-478-5684 (ext. 218).